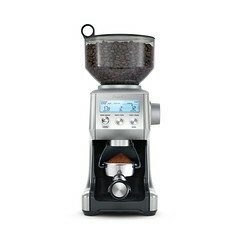 The Breville® BCG820BSSXL – Smart Grinder Pro™ – How do you get the dose you need for the grind you select? The Breville® Smart Grinder™ Pro automatically doses the same amount every time you grind for your perfect shot, every single cup. A. Bean Hopper Lid. B. Bean Hopper. C. Stainless Steel Conical Burrs. D. LCD Screen. E. GRIND AMOUNT/PROGRAM Dial. F. SHOT/CUPS Button. G. Grind Outlet. H. Grind Tray. I. Grind Size Dial. J. START/PAUSE/CANCEL Button. 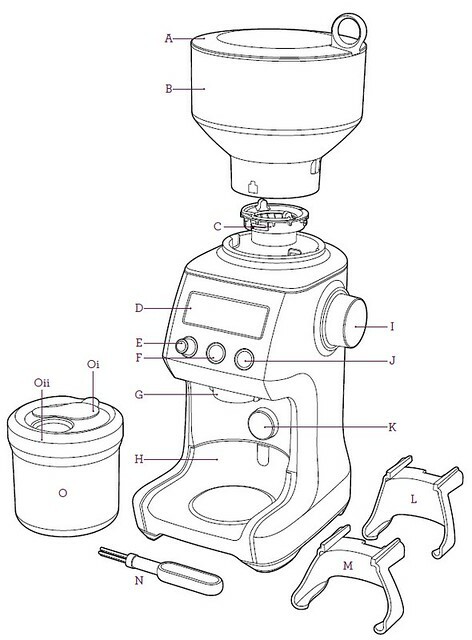 K. Portafilter Activation Switch. L. 50mm - 54mm Portafilter Cradle. M. 58mm Portafilter Cradle. N. Conical Burr Cleaning Brush. O. Grinds Container. Oi. Container Cup.